Ethanol’s chemical formula is C2H5OH. Picture 1. 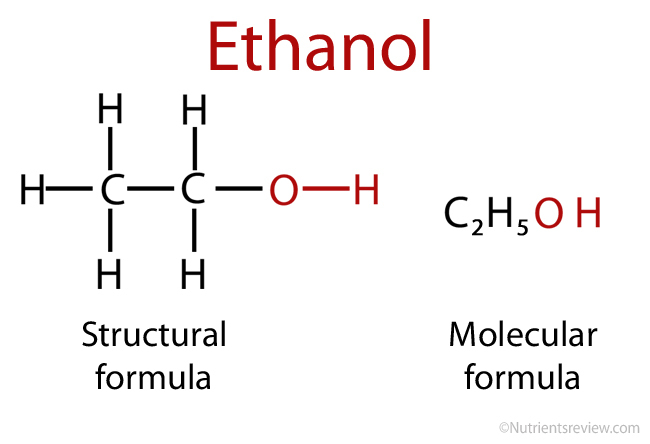 Ethanol structural and molecular formula. attached to a saturated carbon atom. At room temperature, ethanol is a clear, colorless, volatile liquid with a characteristic odor. When diluted, it is somewhat sweet, but concentrated alcohol has a strong, burning taste . Ethanol is highly soluble in water and organic solvents, but poorly soluble in fats and oils . Density of ethanol at 68 °F (20 °C) is 0.789 g/mL . Pure ethanol is neutral (pH ~7) . Most alcoholic beverages are more or less acidic: table wine pH = 3.3-3.7 , beer pH ~ 4 . Melting point of ethanol is -173.4 °F (-114.1 °C) . Concentrated alcohol (96% alcohol by weight) can catch fire at 63 °F (17 °C) . 22 Responses to "Alcohol (Ethanol) Chemical and Physical Properties"
Nice piece and am highly impressed. Please can I get more information on the procedures for measuring some of the physicochemical properties? You may want to search for “alcohol measuring equipment” or so. On the Nutrients Review we covered alcohol mainly from the consumption and nutrient viewpoint. Most online sources claim, the boiling point of ethanol is around 173.3 °F (78.5 °C). It’s all above in the article. For your study purposes, this might be better described in your recommended study book. Where are the chemical properties please?. From chemical properties, only the formula is published, because I don’t think that more description is needed for alcohol as a nutrient on this website. How does the ethanol affect on water pH? Ethanol has very little effect on water pH. This is easy to search online. How long does it take Ethanol to boil and melt? It depends on temperature and pressure. Can I ask for properties of ethanol at certain countries like when winter in russia and summer, what effect does weather and climate have? I am from a tropical country and I want to further research this type of chemical. Thanks by the way for the info above. Some people like alcohol in the winter, because it dilates the arteries in the skin and gives a feeling of warmth. In contrary, at summer, alcohol can cause excessive sweating. I need more explanation because this information is not sufficient. what is pure point of ethanol? what is flash point of ethanol? “Pure point”? I don’t know. Flash point is explained in the article above.